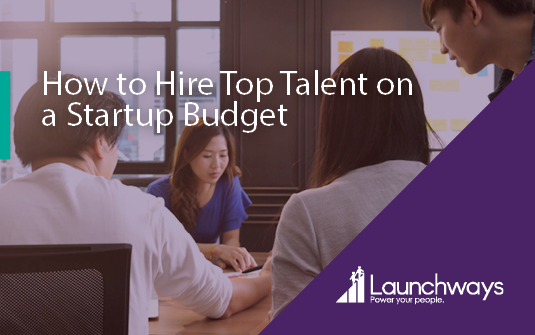 Whether you’re pre or post-funding, hiring top talent on a growing business’ budget is challenging. Larger organizations can offer candidates lucrative salaries, stability, and expensive perks. However, there are several strategies you can use to hire great talent while keeping costs down. In cases when you can put off bringing in a full-time team member, an independent contractor or freelancer may be the best option. For example, you might contract a developer to mobile-optimize your website or build an app for your product. In these cases, hiring a full-time team member doesn’t make sense. Contract employees allow you to leverage a wide range of talent without committing to hiring a full-time employee. Consider contracting commission-only salespeople or manufacturer’s reps if you’re not ready for a full-time sales hire. Another great idea is to hire freelance marketers to write and promote content for your blog or to execute your social media strategy. Sites like Upwork and Guru can help you find freelancers to fit your budget. If you need extra help but aren’t quite ready to bring a full-time staff member into the role, a part-time hire may be a great option. There are many highly-skilled individuals looking for part-time work. A part-time hire allows you to get the help you need while also remaining payroll-friendly. While interns may require guidance and coaching, there are several areas they have natural strengths in. As part of Generation Z, most interns are highly skilled in social media and online presence. If you partner with local colleges, you can find interns in nearly any field from marketing, to accounting, to software development. You may choose to make your internships unpaid or paid. Paid interns can receive an hourly wage or stipend. It’s important to understand that although interns can be valuable, low-cost team members, they will need significantly more guidance than traditional employees. When recruiting talent, may business owners make the mistake of overlooking non-traditional employees. Non-traditional employees might include those who are not currently working, those looking to re-enter the workforce, older employees, or employees who are outside of your industry. While non-traditional employees are often overlooked, these individuals present a unique opportunity for your business. Often they are extremely eager to work and will go above-and-beyond for your business. It’s also not uncommon for their salary expectations to be more in-line with what a startup can afford. You can leverage LinkedIn to source and outreach to non-traditional employees. People, especially Millennials, are willing to sacrifice a higher salary to work somewhere they truly enjoy working. Making your company a great place to work can be your secret weapon in the struggle to hire and retain the best talent. Offering attractive employee benefits and team perks is a great way to improve workplace satisfaction and attract top talent to your company. Flexible scheduling: allow your employees to work non-traditional hours. For example, an employee with a flexible schedule might work 10:00am-6:00pm or 8:00am-4:00pm. Another example of flexible scheduling is to allow your employees to come in late or leave early on some days without taking PTO. Many employees see flexible scheduling as a huge value add as it allows them to take care of their families while also balancing their workload. Remote working: allow team members to work remotely, either some of the time or all of the time. Offering a remote working arrangement doesn’t cost your business anything but is seen as an attractive perk by potential employees. Casual dress: nowadays most employees don’t want to put on a suit every morning to go to work. Offering casual dress and a relaxed work environment can make your business a more attractive place to work for younger talent. Standing desks: having standing work areas in your office requires a small financial investment up front but can be a huge value-add to your employees. Many Millennials realize that “sitting is the new smoking,” and appreciate a work environment that encourages healthy behaviors. Bring your dog to work: if your office space accommodates it, allowing employees to bring their dog to work is another no-cost way to appeal to great talent. For employees with a dog, being able to bring their dog with them to work not only gives them piece of mind but also saves them significant costs on pet care. Food and drink freebies: offering your team free snacks, soda, or coffee can help boost morale and make your company a great place to work. Team meals: whether it’s once a week or once a month, offering a free catered meal to your team is an attractive benefit. Corporate responsibility: give employees dedicated paid time off to volunteer on a monthly, quarterly, or yearly basis. Nowadays, employees are looking for a workplace that affords them a greater purpose in life. Instilling opportunities for volunteerism can make your company more attractive to purpose-driven employees. While larger companies attract employees with lucrative salaries and stability, startups afford their employees the opportunity to directly reap the rewards of the company’s financial success via equity in the business. Equity is a unique bargaining tactic startups possess that larger organizations don’t, and it should be leveraged accordingly. If a particular candidate is risk-for-reward driven, they will often forgo a higher salary now for the promise of potentially greater financial rewards in the future. Not to mention, financial equity aligns your team with the company’s long-term objectives. As such, aim to actively involve these team members in important business decisions moving forward. Another strategy to hire great talent when your cash flows are tight is to offer a lower salary upfront, but with the promise of incremental salary increases in the short-term future. For example, you might offer an employee 60% rate of market compensation up front but include the opportunity for 80% market salary within one year if a financial company milestone is met. You might also structure employee salaries with a below-market base but the option for a significant year-end bonus if your company’s financial goal is met. Aligning compensation with company performance keep costs down and aligns employee interests with company goals. What methods do you use to attract and hire great talent on a tight budget? Drop your ideas in the comments box below. Employee engagement is key to your employees’ morale and productivity, which has an important impact on your bottomline. Understanding what employee engagement is and how to leverage effective employee engagement surveys is a great place to get started with creating a more engaged workforce. 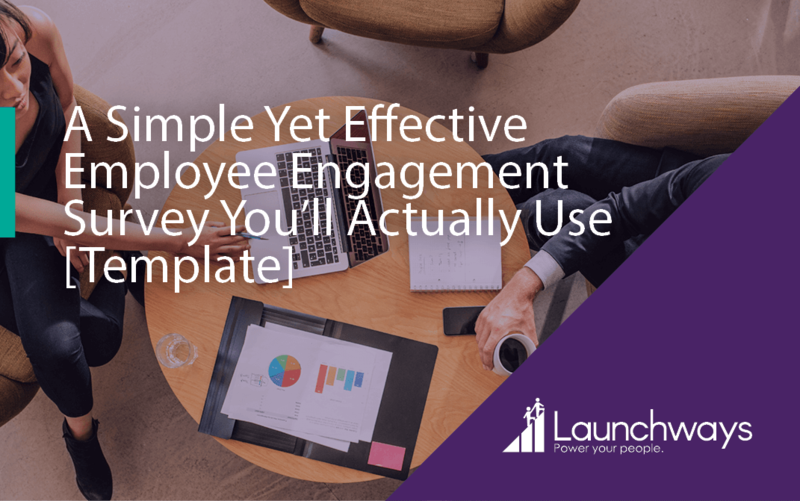 In this post I’ll explore why employee engagement is important, then outline a highly-effective employee engagement survey template, and finally provide step-by-step instructions on how to get started with quantifying and improving your company’s employee engagement. Employee engagement is the level of enthusiasm, dedication, and connection employees have to their organization and their work there. Employee engagement measures how motivated employees are to exceed performance expectations and indicates how committed employees are to staying with the organization for the long-term. Employee engagement is the direct results of company culture, management practices, and the overall work environment created. Employee engagement is important because engagement can have a big impact on your workforce’s productivity, which affects your bottomline. Several studies have correlated an engaged workforce with a multitude of business benefits. A survey of over 24,000 businesses conducted by Gallup found that companies in the top quartile of engagement average 18% higher productivity and 12% higher profitability than companies with poor engagement. An additional survey of over 600,000 employees conducted by the UK government found that companies with high employee engagement increased income by 19.2% while companies with low engagement saw revenue drop by 33% over the same period. Research by CultureAmp also indicates that engaged employees are 20% more likely to recommend their employer on Glassdoor—a critical component to attracting top talent. Their research also showed that engaged employees are 30% less likely to be actively looking for another job. Even with all the above benefits, many companies are not doing a great job at creating an engaged workforce. Studies by Gallup found that only 33% of employees are engaged at work. They also uncovered that organizations with a poorly engaged workforce experienced 30-50% higher turnover rates than companies with engaged employees. The good news is that there are several steps you can take to improve employee engagement at your company. This process begins will implementing highly-effective engagement surveys. Engagement surveys get a bad rap for being ineffective. This is usually because they’re too long, poorly designed, ineffectively distributed, or lack high-impact questions. However, with the right approach, engagement surveys can provide increased insight into your workforce’s engagement, productivity, and job satisfaction. Effective engagement surveys transform anecdotal employee experiences into hard data, which will allow you to strategically approach, monitor, and refine your employee engagement efforts. Before customizing your survey questions, your first step should be to identify benchmark engagement levels. Data without the context of industry-relevant benchmarks will not provide useful insights. Because employee engagement varies widely with company industry and size, take these into account when researching benchmarks. When designing your questions, remember there are several facets that play into an employee’s overall engagement level. These include employee opinion on management, overall work environment, relationships with coworkers, opportunities for advancement, and understanding and belief in the company mission. A good employee engagement survey should include questions that determine satisfaction in each of these areas. Don’t forget that an employee engagement survey only matters if you plan to act on the results. In advance of conducting your survey, establish buy-in from leadership and put time on the calendar to review survey results. 1. On a scale of 1-10, with “1” being very unlikely and “10” being very likely, how likely are you to recommend [Company Name] as great place to work? A Net Promoter Score is a single-digit figure that summaries a customer’s satisfaction with your company. In the context of an employee engagement survey, you can reframe this question to uncover your employee workplace satisfaction, therefore creating an “internal” net promoter score. An employee’s likelihood of promoting your company as a good place to work is a strong indicator of their overall engagement level. 2. I receive recognition for a job well done. Receiving praise and recognition is one of the strongest influencers of workplace satisfaction and employee engagement. It’s important to help employees understand how their work impacts the rest of the organization. This question can gauge employee satisfaction with the amount and quality of recognition they receive. 3. I trust my immediate supervisor/manager. Trust is a crucial foundation for any productive manager/employee relationship. Employees and managers don’t have to be friends—but for it to be a positive relationship there must be a basic level of trust. Employees who don’t trust their manager will struggle to perform optimally and become engaged. 4. I trust the upper management/leadership team. Similar to the previous question, an employee’s trust in upper management is critical for an engaging work environment. A high level of trust in company leadership indicates employees believe in the leadership team’s company vision and their ability to achieve it. 5. My coworkers are committed to doing quality work. This question indicates an employee’s perception of the overall work culture. Environments where all employees are held accountable and motivated properly are the best for employee engagement. If employees perceive that their coworkers are not being appropriately held accountable, this can create a toxic work environment. The above question will gauge your employee’s perception of the work dynamic between employees. 6. My coworkers respect each other. This is another question to help gauge the work environment. It’s important that your team is establishing mutual respect. If your workplace is filled with gossip, harassment, or other negative sentiments it can quickly create a toxic work environment. Use this question to gauge how positive the relationships between employees are. 7. In two years, I still see myself working at [Company Name]. This question can give some insight around your employee retention rate. If employees don’t envision a future with your organization, this indicates unhappiness with the workplace environment and an absence of transparent future career opportunities. 8. [Company Name] motivates me to go above and beyond what I would in a similar role elsewhere. This question gets at your employee motivation levels. In organizations with high employee engagement, employees are motivated to go above and beyond because they believe in the mission of the organization and understand their important part in achieving this vision. If your employees do not feel motivated to go above and beyond you should identify opportunities to increase performance. 9. I have access to the tools, resources, and training I need to do my job well. This question gets to the heart of job enablement at your organization. The point of this question is to understand if employees believe they have the resources they need to perform their job at the highest level. 10. I understand what I need to do to be successful in my role. This question pinpoints if your employees’ job expectations are clear. If employees have a clear understanding of their success metrics, it gives their day-to-day work direction and purpose. It also instills a feeling of upward mobility which helps keep employees on board. If employees indicate their job expectations are unclear, this can indicate a poor relationship between management and employees. 11. I believe there are good career opportunities for me at [Company Name]. This question also hones in on employee perception of future opportunities. If employees perceive good future opportunities for themselves at your company they’re more like to be high-performers and much less likely to look for another job. If employees do not believe there are good opportunities for them then there could be a lack of transparency around growth opportunities or underinvestment in employee training and development. 12. Is there we could be doing better at [Company Name]? In an employee engagement survey it’s always important to provide an open-ended question. The point of this question is to provide employees an opportunity to give candid, anonymous feedback. While this feedback won’t be quantified, it can provide some anecdotal evidence towards areas of your engagement strategy that could be improved. Customize the questions with your company name. Also feel free to further customize the questions, omit ones that you don’t believe are relevant to your workforce, and add your own questions. Just remember to keep the survey relatively short (15 or less questions is ideal for maximum impact). Determine how you will distribute your survey. The easiest way to distribute an engagement survey is digitally. Google Forms or SurveyMonkey are both great options for distributing your survey and analyzing the results. It’s important to note that the most effective engagement surveys are completed anonymously. If the surveys are anonymous, employees are more likely to be honest and give candid feedback. 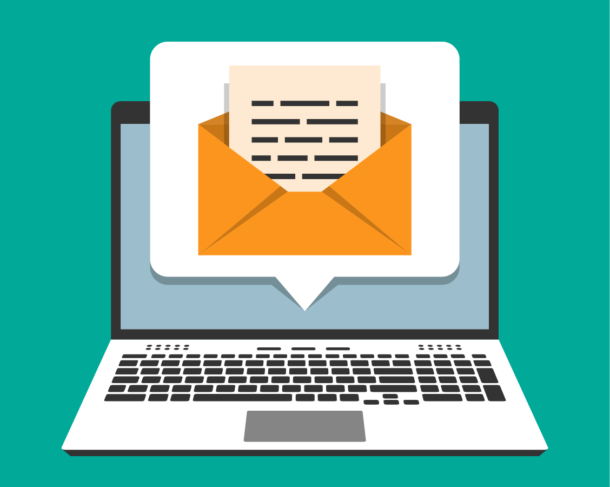 No matter which platform you opt to send your survey through, make sure your survey does not require employees to entire their name or email address. Distribute your survey via email. Including a note from the leadership team about the purpose of the survey can help drive forward your engagement vision. Make sure to follow-up with your employees several times to remind them to complete the survey. After you’ve collected responses, analyze the results. Gather your leadership team to discuss the findings from your survey. Compare your engagement levels to industry benchmarks. Based off the results to specific questions, identify the biggest areas of opportunity for improvement. Create a plan of action as to how you’ll address these areas. Set a timeframe for when you will distribute another engagement survey to measure changes in engagement (three to six months is ideal). Employee engagement creates a happier, more productive workforce. Establish buy-in from your leadership team about the importance of employee engagement. Always compare your engagement data against industry benchmarks. Use short, high-impact surveys (and make sure they’re anonymous to receive honest feedback). Use the results of engagement surveys to discover areas of opportunity and create an action plan for increasing employee engagement. Do you already use an employee engagement survey? Will you start regularly distributing and analyzing engagement surveys? How important do you think employee engagement is in the modern workplace? I’d like to hear your thoughts—drop them in the comments box below.